But don’t freak out! An audit is simply a systematic inspection of a business’s accounts to ensure accuracy. And for musicians, this means testing your skills and knowledge to ensure that you’re on track in the essential areas of improvisation – theory, ear training, and tunes & language. What exactly do you know? Where exactly do your ears start getting fuzzy with the melody and harmony? When and where do your musical skills hit a wall? So for the next 30 minutes grab your instrument or pull a chair up to the piano. Here are 36 questions that will cover the stuff you should’ve learned in school and the techniques you need to know get to the next level as an improviser. Being an improviser, or rather a successful improviser, means coming to each playing situation with a certain set of harmonic and melodic skills. Whether it’s a rehearsal, a jam session, or a concert you are expected to have a basic level of musical knowledge and technique. And if your aim is to improvise a great solo, you need to know this information on an even deeper level. Play an Ab Major scale. Play the lydian mode of the Db Major scale. Play a C# dorian scale. Play an E melodic minor scale. Scales alone aren’t the hidden secret to improvising over your favorite tune, rather a necessary theoretical and technical foundation for your musical approach. Memorize them well in all keys so in performance you can focus on the creative aspects of improvisation! Spell out an E half-diminished chord starting on the root. What is the 7th of an Ab Major 7 chord? Arpeggiate a B7 chord, ascending up to the 9th and descending to the root on your instrument. Play an A dominant bebop scale. Play an Ab major bebop scale. As you’re developing your musical approach, the bebop scale can be an effective tool for navigating V7 sounds and creating linear motion. 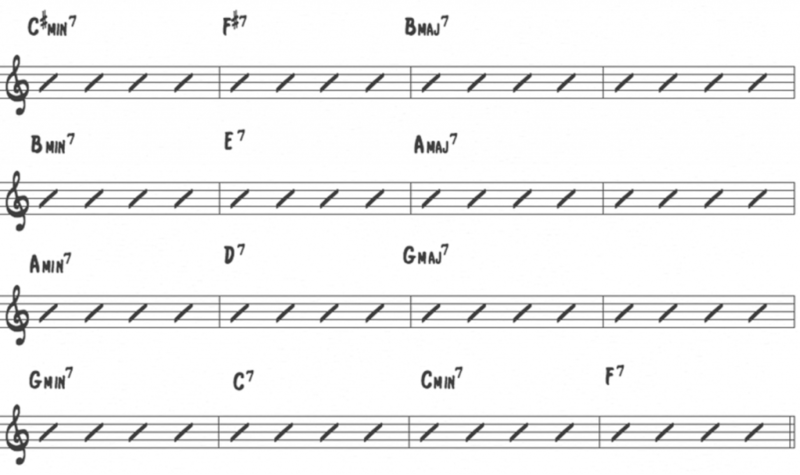 Study how players like John Coltrane and Sonny Stitt utilize this scale in their lines. What is the V7 chord in the key of B? In the key of Eb, what is the ii chord? D half-diminished is the viiØ chord of what key? Based on the exercise above, what would a ii- V7 in F minor be? What’s the b13 of A7? What’s the b9 of C#7? Notice any similarities? How does F melodic minor relate to an E7 chord? As an improviser, theory is vitally linked to technique. Knowing the key signature, practicing a few scales, or memorizing the chord progression isn’t going to cut it. Along with knowing a musical concept, you need to be able to play it. What is the ii-V progression in the key of B? If the ii- chord is Ab- what is the I chord? What is B7 the V chord of? Before you can play melodic ideas over a ii-V or a turnaround, you need to have these chord relationships ingrained in your mind. What’s the tritone sub of D7? E7 is the tritone sub of what chord? The essential theory that you need to know to play a great solo is something you can mentally grasp and ingrain in a short amount of time – if you focus on the right exercises. If you’ve found yourself stuck on some of the questions above, don’t despair. Start by focusing on the fundamentals of theory and visualizing these concepts in every key. A little mental practice each day will yield tangible results. For a more in-depth approach, we’d recommend checking out our Visualization for Jazz Improvisation course, which covers all of this and more. A musician’s ears are the key to creative improvisation. Like a photographer’s eye for composition or painter’s sense of color and light, your ears are the tool that will help you unconsciously identify the important elements of music and unlock your creativity. Without a developed ear you’re stuck trying to improvise with a mental grasp of music theory – the frustrating situation many beginning improvisers find themselves in, making the process of creating a solo so hard. This is why we’re going to put your ears to the test. So how good are your ears when you take away the sheet music or toss out the Real Book? The first step in training your ear is hearing a pitch, internalizing it, and recreating it with your voice and your instrument. What interval is being played below? Now try it in the context of a musical line. What interval is played 3 times at the end of this phrase? What is the quality of this triad? What is the quality of this 7th chord? What is the quality of the 7th chords used in this vamp? Sing the third of this V7 chord. What chord tone is being sustained over this minor 7 chord? Let’s try it in context. What chord tone is being played over the Major 7 chord at the end of this phrase? If the first chord is the I chord, what is the following chord movement? Listen for the roots of the chords and try to determine the chord quality. What is the quality of the underlying chord? Can you identify the specific chord tones of the line (what is the first note, the high note, the last note, etc.)? Ear training for the improviser needs to go beyond the basic interval recognition that you find in most courses. Whether you’re practicing, performing or just jamming with your friends, you need to be able to identify and internalize the melodic and harmonic aspects of a piece of music. These skills directly relate to your ability to transcribe solos, to learn tunes, and to figure out chord progressions. This is why ear training is so important. If you think your ears need some work and you want quickly improve them, be sure to check out our Ear Training Method course for an all-inclusive and in-depth instruction on the musician’s ear. And it’s not about the various exercises that you faithfully practice in every key. It’s all about that moment when you get out there and put these skills to the test in the real world. Making music with other musicians, playing tunes, and improvising in front of an audience. You see the study of jazz improvisation isn’t confined to a book, a classroom, or the licks you run in your practice session. 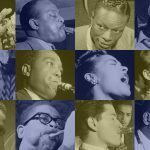 It’s vitally connected to the history of musicians that came before you and the tunes in the jazz repertoire. As a soloist you need to have a working knowledge of the language of your musical heroes and the common standards every improviser should know. Along with this harmonic and melodic information, you also need to learn to play with time, swing, and style. This is where you combine your theory knowledge and technique with your ear training to learn the language of jazz. As you develop your vocabulary and expand your listening, strive to transcribe melodic techniques and language over the 4 main chords types you’ll encounter in the jazz repertoire: major, minor, dominant, and half-diminished. As you listen, try to isolate the unique characteristics of the line. Which chord tone does the line start on? Which chord tone does it end on? When you find a piece of language or musical concept that you like, analyze why it works and learn it in every key. Keep in mind that when you transcribe a line you are looking for more than a lick to insert into your solos. Aim to understand the musical concepts at work behind the line so you can transfer and recreate the techniques in your own solos. Can you identify by ear the defining characteristics of the line: minor scale motion, half-step resolution from ii to V7, bebop scale fragment, enclosure? This is where your theory and technique come into play. Do you have technique worked out in all keys? Can you visualize the progression and intervallic content as you move to new keys? What about over the bridge to Cherokee? Can you apply the same line to this progression? 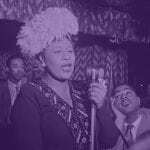 It could be Billie’s Bounce, Au Privave, Straight No Chaser, or any number of blues heads that are often called at jam sesseions. As an improviser, you need to know how to play the blues. 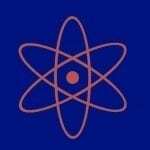 At some point on your musical journey you need to transition from the study of the theory and technique of music to the study of creating music. Beyond the scales and chords, your goal as an improviser is to create melodic ideas that have sound, style, articulation and time. If you’re still stuck thinking about scales and chords instead of creating lines and solos that you hear, check out our newest course Melodic Power. Inside you’ll find essential techniques, exercises from real solos, and in-depth instruction for harnessing the power of melody over the common chords of the jazz repertoire. So how did your musical skills fare? Better than you thought? About where you guessed? Or not even close?? If you’re serious about improving as an improviser you need to be honest with yourself and identify the areas of your musicianship that need work. The 36 questions above run the gamut from fundamental knowledge to the more advanced techniques you’ll need to know as you advance on your musical journey. 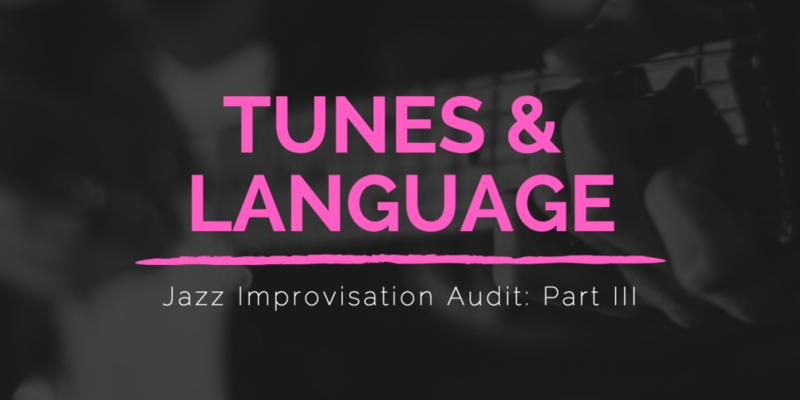 In each section we’ve included links to relevant lessons that will help you build these skills, covering the areas of theory, ear training, and jazz language. Once you know what you need to work on, it’s crucial that you know how to practice and that you craft an effective practice plan. 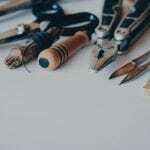 Along the way, remember that these skills or problem spots aren’t conquered in one day – they take consistent daily practice that is focused and goal-oriented. However, a little work each day will gradually lead to the big musical goals that you have. If you put in the work, one day you’ll become the musician that you want to be.